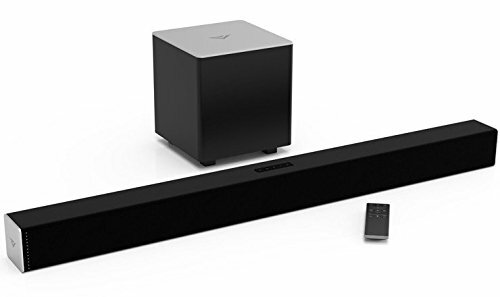 Premium Audio, Immersive Bass Upgrade your TV audio experience with the VIZIO 38" 2.1 Sound Bar System, a great fit for 42"+ Class TVs. The wireless subwoofer delivers a room-filling audio experience with deep thumping bass, and built-in Bluetooth allows you to wirelessly stream audio from your mobile devices. 2.1 Sound Bar System The 2.1 Sound Bar System features powerful speakers paired with a wireless subwoofer, delivering booming sound with crystal-clear audio quality. This combo brings an enticing home theater experience to the comforts of your home. Expansive Audio Upgrade to premium audio with VIZIO's 38" 2.0 Sound Bar. Best in class audio performance delivers up to 100 dB of room filling, crystal clear sound with less than 1% total harmonic distortion1. Wireless Subwoofer Rich, powerful bass transforms movies, music, and TV into an explosive experience. Wireless means your home stays free of clutter while you get great sound. Suited for Your Style and Space VIZIO Sound Bars are designed to blend in with a wide variety of placement options. They fit with any space and are sized to match your TV. Explore all the convenient and appealing places you can put your VIZIO Sound Bar. Seamless Streaming Built-in Bluetooth allows you to wirelessly stream audio from your mobile devices. Lose the wires and listen to your music with a tap of a finger from anywhere in the room. Streamlined Design VIZIO Sound Bars are crafted to accentuate your TV with a minimalist body style that blends in with any room of your home. Premium Audio Technology VIZIO Sound Bars utilize Dolby and DTS audio technologies to deliver elevated multi-channel audio for the most immersive sound quality. Dolby Digital The audio standard for cinema, broadcast, DVD, Blu-ray, and streaming content, Dolby Digital surround sound provides dramatic spatial dimension to soundtracks and enhanced audio definition for an engaging listening experience. Dimensions and Weight: Product Dimensions: 38"W x 3"H x 3"D; Product with Stand Weight: 5.8 lbs. ; Subwoofer Dimensions: 8.3"W x 9.1"H x 8.3"D; Subwoofer Weight: 7.21 lbs. ; Product Packaging Dimensions: 40.25"W x 15.5"H x 10.5"D; Product Packaging Weight: 17 lbs.